Queensland has, in recent years, experienced relatively low employment growth and low net interstate migration (see chart above). In previous posts (e.g. Victoria continues to lure Queenslanders), I have noted how fewer employment opportunities in Queensland may have reduced the attraction of the State to interstate migrants. 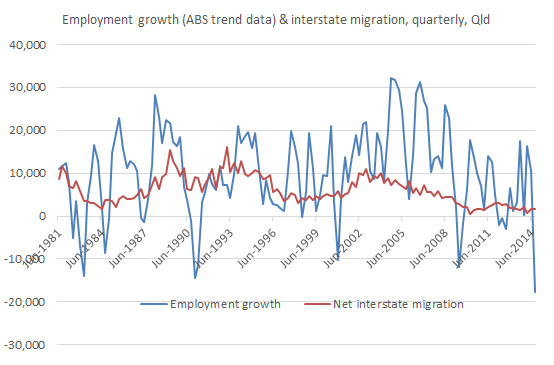 I should have been clear that causality can run in the other direction, too, from interstate migration to employment growth, as interstate migrants boost demand in the Queensland economy, for goods and services and for housing. So a fall in interstate migration would result in an adverse shock to demand that may impact employment and economic growth. Queensland’s economy (especially that in SE Queensland) has apparently been highly dependent on the ‘migration industries’ stimulated by rapidly increasing population – originally associated with strong interstate migration from NSW and Victoria…Any slowdown in population growth is likely to have the same sort of feedback effect (through reducing job prospects) as rapid population growth did for many years (through increasing job prospects). There appears to be some evidence of the feedback effect at work in the lack of growth (and indeed a possible decline) in construction industry employment in Queensland in recent years. I’ve no doubt that lower interstate migration adversely affected the building industry. It has taken a long time for Queensland to get back to levels of residential building approvals seen prior to the financial crisis of 2008 (see Apartment & townhouse approvals double in January – catch-up or over-shoot-in supply?). This entry was posted in Housing, Macroeconomy, Migration, Population and tagged construction, employment, interstatemigration, qld, queensland. Bookmark the permalink.